In the book Antifragile: Things that Gain from Disorder, Nassim Nicholas Taleb shared insights on optionality that can be expanded to include new product development environments. This post provides an introduction to the non-linear gains associated with antifragile systems that may be realized by designing new product development environments that help individuals improve their capability to synthesize many new options continuously and enhance their proficiency to exercise options that are attractive. This post includes a comparison to concepts represented in Boyd’s OODA Loop sketch. Taleb’s classification of systems as fragile, robust, resilient, and antifragile may be used to characterize development environments. Every development environment can be characterized in terms of its fragility, robustness, resilience, and antifragility. A development environment that tends to be fragile does not welcome disorder. When uncertainty is injected, the results may be unpleasant. Unpleasant results may include delays, cost overruns, and insufficient adoption of the product. Individuals tend to be frustrated. The more fragile the development environment, the less likely it is to thrive. From project-to-project, a robust development environment tends to survive unchanged. Processes tend to be preserved. Individual contributors tend to retain their employment status. From project-to-project, a resilient development environment survives changes from external factors. After a project is complete, there may be changes such as a re-arrangement of the organizational chart. New tools may be incorporated. The organization survives to serve the needs of the next project. An antifragile system thrives and grows when exposed to a moderate amount of volatility, randomness, disorder, and stressors. An antifragile system benefits from a moderate amount of adventure, risk, and uncertainty. Iatrogenesis: preventable harm resulting from the treatment or advice of a healer. Specialists that assume that solutions to development problems relate to their area of expertise. It may be difficult to recognize the harmfulness associated with specific sources because of cognitive biases or unvalidated claims. Recognizing harmfulness is more difficult in development environments that isolate individuals of different functional specialties. 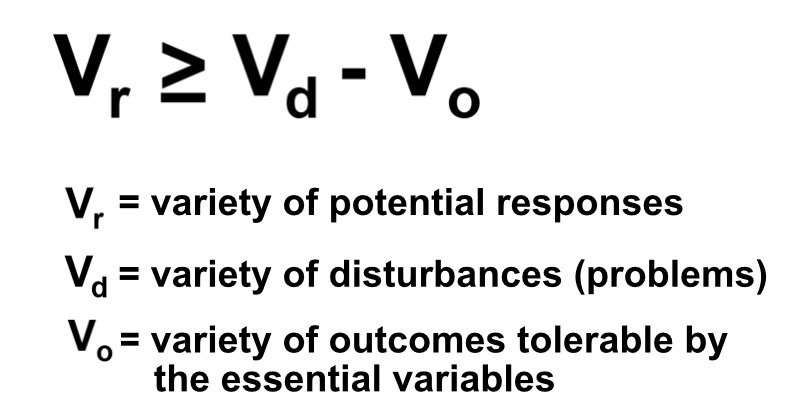 The concept of requisite variety can be used to emphasize the importance of having a diversity of potential responses in a development environment. 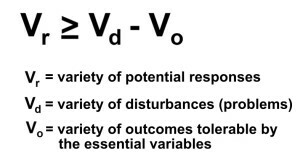 Requisite Variety: For a system to be viable, only a variety in responses can force down the variety due to disturbances. For a development environment to be successful, only a large repertoire of possible responses can address the variety presented by a complex set of development problems that emerge throughout projects. In a new product development environment, requisite variety may be achieved by mobilizing a network of contributors with diverse specialties and multiple perspectives. To be successful, individuals may require additional training, access to individuals with unique expertise, and cooperation. Without requisite variety, previously successful responses to familiar patterns may not be recognized as insufficient responses. Without a variety of potential responses at the appropriate times, a development environment may be fragile. If there is excessive variety, the agility of the development environment may be reduced. To ensure appropriate adaptability, the network determines that certain responses should be amplified. Other responses are attenuated. Disintermediation removes layers between individual contributors and data. It removes barriers between decision makers. One way to facilitate disintermediation in new product development environments involves individual contributors experiencing the interactions of customers with prototypes (or other experiments related to the product being developed). Direct observations that promote full-fidelity interactions are preferable to mediation approaches such as presenting individuals with reports that summarize activities. Pair Development is implemented by facilitating the interaction of individuals of different disciplines (such as a coder and a marketer). Pair development provides an opportunity for interaction through activities such as dialog and sketching. The result of pair development should be the synthesis of options, not a summary of previous activities. Typically, no slides sets are used during these interactions. The result of pair development is the synthesis of options that is informed by the analyses available from multiple perspectives. The purpose of pair development is not cross-training. The purpose is to develop a self-correcting focus and direction informed by the analyses of multiple perspectives. Reducing iatrogenesis is a pre-requisite to synthesizing more attractive options. A typical option, such as a financial option, provides a buyer with the potential to take action by a specified date without an associated obligation to buy or sell. Typically, an individual decides to exercise an option based on their perception of value at a specific time. According to Taleb, optionality is the property of asymmetric upside (preferably unlimited) with correspondingly limited downside (preferably small). Optionality: a quality of state where choice or discretion is allowed. The value of a typical option depends on factors such as the negotiation skills of the individuals involved and the type of control individuals have over their decisions. Development options require additional proficiencies. Taleb summarized the experience of Thales, an ancient philosopher. Thales acquired an option to use equipment that may be needed during next year’s harvest. His potential profits or losses were not be determined solely by the accuracy of a crop forecast. If there was an abundant harvest, he could exercise his option for the equipment and be rewarded financially. If the harvest was scarce, he could decline his option and not suffer a loss. The harvest was bountiful and Thales built a substantial fortune. To improve the potential for success in new product development environments, an option must be more than a negotiated agreement based on a speculation. Development options are the most valuable when associated with current capabilities or a capabilities that may be acquired within an appropriate amount of time for an appropriate cost within the project constraints. The approach to development within a network of individual contributors includes the interplay of capabilities with analyses and synthesis. Synthesis is a process of connection. Synthesis generates something new and different. 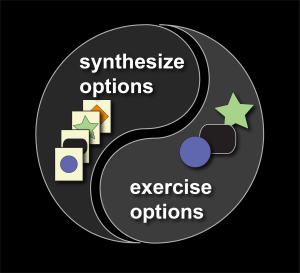 A synthesis approach enables one to imagine how a several capabilities may work together to produce the desired result. In a properly designed new product development environment, proficient individuals analyze situations and synthesize new options continuously. 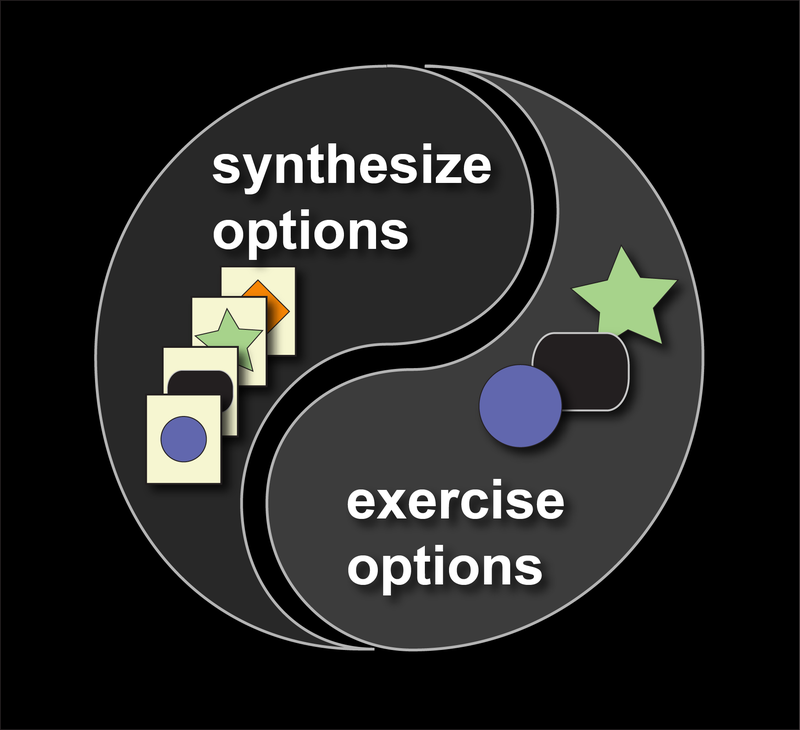 The interplay of synthesizing options and exercising options includes interaction with the environment (feedback) that enables a network of individuals to comprehend, shape, and adapt during development. This enables operation at faster tempos and rhythms and the compression of cohesive observation-orientation-decision-action time cycles. The capability to synthesize many development options and exercise a few attractive development options rapidly and repetitively enables a properly prepared network of individual contributors to realize non-linear gains that are not possible by alternate approaches such as ones that focus on managing mandates. Concepts related to development options have similarities with concepts represented in John Boyd’s OODA Loop sketch. 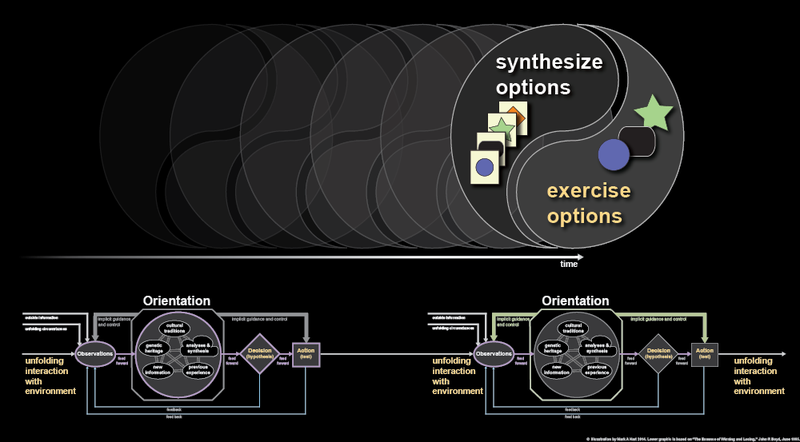 The concept of synthesizing development options is similar to the Observation and Orientation items represented in Boyd’s OODA Loop sketch. The concept of exercising development options is similar to the Decision, Action, and Unfolding Interaction with Environment items represented in Boyd’s OODA Loop sketch. The outcome from cycles of synthesizing a multitude of development options and exercising a multitude of development options is consistent with victory and the representation of a “series of maneuvers” in an OODA Loop context. The non-linear gains associated with exercising attractive options in antifragile environments are similar to Boyd’s themes for vitality and growth. Concepts related to development options have similarities with concepts represented in John Boyd’s OODA Loop sketch. Synthesizing development options is similar to the Observation and Orientation. Exercising development options is similar to the Decision, Action, and Unfolding Interaction with Environment items. Produce new repertoire based on theory and refined by practice with others seeking a high level of proficiency. This requires a sustained, deliberate effort. Develop the capability for rapid cycles of observation, orientation, decision, and action which is based on the OODA Loop concept from John Boyd. Improve the capability to shift rapidly between options which is similar to the concept of Fast Transients from John Boyd. This is similar to improving agility. Improve the capability of individuals to synthesize options that are cohesive across the network and cohesive over the duration of the project(s). Improve the proficiency to exercise attractive options. Identifying attractive options includes developing a holistic perspective and recognizing iatrogenesis. Individual contributors invest much of their time in new product development projects. Their personal investment is what Taleb refers to as “skin in the game.” I refer to an individual contributor’s day-to-day and year-to-year set of perceptions and responses as Development Experience [DX]. There are multiple approaches to improve an individual contributor’s development experience by reducing fragility, increasing robustness, or increasing resilience of the development environment. An individual contributor’s development experience may improve dramatically by designing the development environment to improve antifragility. According to Taleb, “The option is an agent of antifragility.” Options make vitality and growth possible. Development options are agents of development experience. Development options drive non-linear gains in antifragile development networks. Designing to improve development options stimulates better performance from individual contributors even when there is volatility. This inspires better performance from others. This creates virtuous circles, beneficial cycles of development efforts. This inspires greater commitments to project success. Post Development Growth: the positive changes experienced by individuals that result from enhanced new product development capabilities. Post Development Growth includes reflection to achieve cognitive clarity. It goes beyond reflection to action. An antifragile development environment is more likely to produce Post Development Growth. This tends to enable better outcomes in future projects. 3. Too many inputs may be harmful because it may be difficult to discern the valuable from the harmful or signal from the noise. Too many inputs reduce a network’s agility. A requisite variety approach must include ways to evaluate potential contributions to project goals. One approach is the development of “continuously correcting, network-informed schwerpunkt” described in my Reimagining How New Product Development Artifacts Impact What We Should Be Doing Today post.